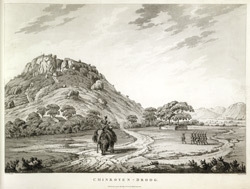 This uncoloured aquatint is taken from plate 8 of Captain Alexander Allan's 'Views in the Mysore Country'. Allan took part in the third and fourth Anglo-Mysore wars and was present at the siege of Srirangapatna. The twenty sketches in this volume were made during the third Mysore war (1791-92). Successive wars with Mysore ruler Haider Ali and his son and successor Tipu Sultan resulted in vast tracts of land passing into British control. A spate of publications recorded the events. Robert Hyde Colebrooke's views of Mysore were among the first to show places associated with Hyder and Tipu, and Allan's views complemented these, with special attention paid to the area's hill-forts. Channarayanadurga in the Tumkur district of Karnataka is one of the nava-durgas ('nine-forts') around Bangalore. Small but strong, it surrendered to troops commanded by Lieutenant Colonel Maxwell, 23 July 1791. Control was officially ceded to the British by the Treaty of Seringapatam at the conclusion of the war in 1792.